Himalayan Ascent is offering an expedition to tackle some of the less-frequently climbed 6000m trekking peaks of the Khumbu. This is a more adventurous alternative to the heavy traffic commonly found on Island and Mera peaks today. The expeditions will teach basic mountaineering skills, and will provide opportunities to climb by fixed rope or alpine style. After landing in Lukla, we’ll spend a pleasant week or so trekking up the valley towards Mount Everest, passing through numerous Sherpa villages including Namche, Phortse and Pangboche. Along the trail, we’ll begin rope training on rock crags at Namche and Phortse. Our introductory climb will be Pokhalde (5806m), which is primarily a rock ascent just off Kongma La (links the Khumbu and Imja valleys). From here, we’ll drop to and cross the Khumbu glacier towards our second, more technically demanding objective of Lobuche East (6119m). We’ll leave our high camp at 5600m on our summit push, from where we’ll use rope fixed by our Sherpa guides. The summit ridge will give you an exhilarating sense of exposure, and also some amazing views towards Mount Everest. We’ll descend the mountain confident in our growing ability to tackle our next slightly harder challenge, Nirekha (6169m). Neighboring Lobuche, Nirekha’s high camp is a close distance situated above a beautiful glacier on a col. The next day, it’s an early start climbing to the summit ridge, followed by a steep 50-60 degree angle climb to the summit. For climbers with previous rope experience and good fitness, our guides can support an alpine ascent with 3-4 persons per rope. Fixed lines will also be established as a second option. We’ll descend on the other side of the col to Thangnak. After successfully submitting 3 peaks, you can either return directly down the valley to Namche, or make a short excursion to Gokyo lakes before circuiting back to Namche. This expedition is perfect for Himalayan climbers or trekkers who would like to try something different to the usual trekking peaks, and for experienced rock climbers who are looking to transfer their technical skills onto alpine terrain at high altitude. You will first do a gear check at your hotel and organise renting any equipment if needed. Then you have a free day to explore the crazy, yet wondrously beautiful city of Kathmandu. Home to 5 World Heritage sites, Kathmandu is a stunning landscape of handcrafted wooden palaces (durbar or palace squares of Kathmandu, Lalitpur and Bhaktapur) and glorious Buddhist stupas (Swayambu and Boudhanath). It’s a city that stimulates all senses, so be prepared because Kathmandu is a city that demands attention. Our trip begins with an early morning 30 min flight to Lukla, that flies over endless rolling hills covered with green terraces. Once in Lukla, we have a short break to organise porters and gear before starting our day’s walk, descending and ascending to Monjo. We pass green villages and colourful maniwalls as we follow the Dudh kusi river upstream. This region is Buddhist so remember to walk clockwise or to the right of maniwalls and prayer flag poles. Monjo is an apple farming village situated near the base of the hill up to Namche. Note, if we leave on a mid morning flight, we may stop earlier along the trail at Phakding (2640m) instead of Monjo. The route crosses several steel suspension bridges covered with katas, white wellwishing scarves, and prayer flags. From the last bridge, it’s a 2-3 hr hike up to Namche. On a clear day, you can catch your first view of Everest from a lookout about mid-way up the hill. Once in Namche, you have the afternoon to rest, do last minute gear shopping or catch locals enjoying the Saturday market. We spend an extra day in Namche before trekking higher to allow our bodies to adjust to the lower levels of oxgyen in the air. In the morning, we will walk up to the Everest View Hotel to enjoy a panoramic view of Everest, Ama dablam and Thamserku. It’s just a taster of the spectacular scenery to come! The afternoon is free for bouldering above Namche, wandering around the bazaar or relaxing over coffee and cakes in the bakery. The trail behind Namche is a gentle track that traverses high above the Imja river with overlooking views of Thamserku and Ama Dablam. We split from the regular traffic of trekkers heading to EBC by taking the higher road up to Mong for lunch enroute to Phortse. Many villagers still depend on potato and buckwheat farming here, but Phortse is also known for producing many climbing Sherpas to supplement incomes. Every January, Phortse hosts the Khumbhu Climbing School, an institution that invites international and local guides to train aspiring locals in basic and advanced mountaineering. We can spend the afternoon rock climbing at a local crag used by the school. Heading out of Phortse you will see Cho Oyu, the 6th highest mountain in the world up the Ngozumba glacier leading to Gokyo lakes. The trail to Pangboche is an easy day of traversing with views of Tengboche monastery just across the valley. Pangboche is the highest permanent settlement with the oldest monastery in the Khumbu. The horizon from here to Lobuche is dominated by Ama dablam, (6856m) one of the most picturesque mountains in the Khumbu that is technically demanding to climb. As we hike up the track towards Dingboche, there’s a distinct change in the landscape as we cross the 4000m barrier. High altitude scrubs replace trees and formidable mountains suddenly appear within reach. Dingboche is the first of a series of settlements leading to Everest base camp established to accommodate trekkers. It is a seasonal village with a few fields and yaks. The afternoon is free to use internet or to do some much needed laundry. There are a few bakeries you can try too. Another “rest” day for acclimatisation will take us up to the ridge overlooking Dingboche for views into the Imja valley. You will see the great faces of Nuptse, Lhotse and Imja Tsa (Island Peak, 6189m) and another face of Ama dablam. There’s also the option to walk to Chhukung village or visit Pheriche. Alternatively you can rest up, enjoy the sun, drink hot chocolate and curl up with a book too. We’ll make an easy ascent up towards Imja Valley camping above Bibre on the trail to Kongma La pass. The rest of the afternoon is free to enjoy views of Imja valley. We continue up the route stopping just short of Kongma La pass by lakes for our base camp. We will be able to appreciate close views of the summit from camp. From camp it’s a short hike to Kongma La pass that provides access between the Imja and Khumbu valleys. Reaching the Pokhalde summit is a rock scramble left of the pass. After celebrating our first summit success, we’ll return to base camp for lunch, pack up camp and then make the steep descent from the pass to Lobuche. In the morning we’ll trek to Lobuche base camp, an easy traverse contouring around Lobuche on the south side of the mountain. The camp provides uplooking views of neigbouring but challenging peaks of Taboche (6367m), Cholatse (6335m) and Arakam Tse (6423m). Today is a training day in base camp to practice climbing on fixed lines (up on a jumar and descending on a belay device). It’s also a contingency day to allow for poor weather conditions that may delay a summit attempt. After crossing a grassy meadow to the foot of Lobuche peak, we ascend steeply on a rocky trail to a col for lunch. 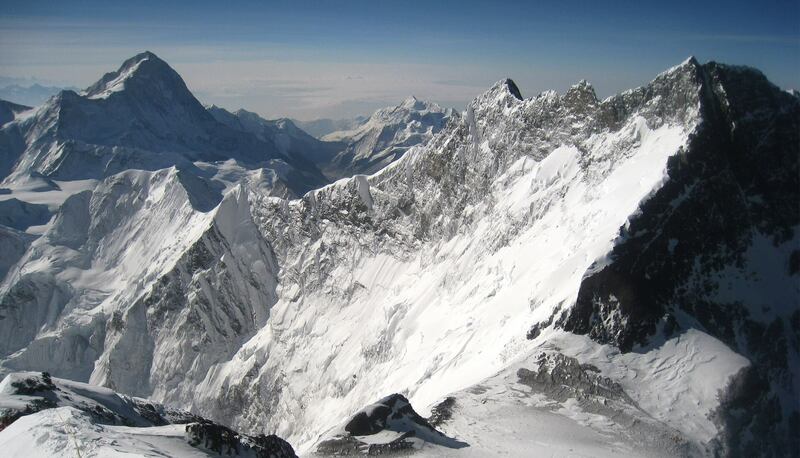 From here, we can appreciate magnificent 360o views of Everest, Lhotse and Nuptse. To reach high camp along the start of the summit ridge, it’s another 1.5-2 hr rock scramble or snow climb depending on conditions. Do not miss the stunning sunset view from high camp! Summit day begins with an alpine start at 4am for a quick breakfast and dressing for a summit climb. We leave camp by 5am and walk up the ridge for 50m to a face. Climbing on fixed lines up the 45o snow wall, we then reach the ridge proper. We follow the ridge around seracs (snow/ice climb) to the 1st or false summit. Be prepared for exposure along the way as we walk on the ridge. It’s a quick rappel down from the 1st summit, then finally up another 60m to the real summit by mid morning. We return by the same route to high camp for a break and pack up camp, and head to base camp. Nirekha base camp is located a short distance from Lobuche base camp on the West side of Lobuche. After our previous full day climbing Lobuche, this day is easy. We will reach our camp by some lakes before lunch, so that the remainder of the day can be spent soaking up warmth from the sun and resting. You will be able to appreciate our final and most challenging peak from camp. Nirekha sits just northwest behind Lobuche on the same chain of mountains. Depending on conditions and for those with previous rock climbing experience, your guide will take you through the basics of roping up to a line for alpine style climbing. After 2 summits and the hardest still to come, we will take an extra day to rest in base camp. This is also a weather contingency day to allow extra time for summit opportunities should bad weather delay our summit pushes. Climbing up to our high camp below a col west of Nirekha is a slow ascent that passes Cho La pass (5330m) on the left and Nirekha itself on the right. The route includes a short but steep (45o) ice and snow slope. We will mostly rest to prepare for our big and last summit day. The day will start early with an alpine morning start. The climb first follows the snow covered west ridge up. The route progressively gets steeper (35-50o) and is quite exposed on some sections. We will bypass seracs, cross crevasses and climb an ice wall to eventually reach the north summit of Nirekha. This route is more technical than Lobuche, and it will require a high level of fitness and confidence to attempt it. We return by the same route to high camp for a much deserved rest! Congratulations, you have summited 3 peaks! We will drop down the col on the north Kangchung side, and then climb south to rejoin the trail that crosses Cho La pass. From here we’re descending to lower altitudes, stopping first at Thangnak, an entry point into the Gokyo valley. From Thangnak, Gokyo and its serene glacier lakes is a 2 hr hike north. For those still with energy, there is the option to make a day hike to view the lakes. Alternatively, the trail can be followed directly south to Dole. With the high climbs now behind us, our adventure leads us back to Namche for refreshing showers, expresso coffee and internet access to share our climbing success with friends and family! The trail follows the Dudh koshi river, across the valley you can enjoy the farming terraces of Phortse and stunning views of Ama Dablam before we re-enter Namche. It’s a big downhill trek from Namche to the valley floor. Take this opportunity to farewell Sherpa culture as the trail undulates through the villages. This is our last night as a group with your guides and porters. The flight will give you a final close look at some Himalayan giants (Gauri Shanker, Langtang). Once in Kathmandu, you’re free to relax. A massage in one of the many beauty spas is highly recommended! If you didn’t make it to Bhaktapur or the other durbar squares in Patan/Kathmandu, make sure you don’t miss these world heritage sites. They provide another viewpoint of Nepal’s diverse culture and ancient architectural talents. personal climbing equipment (can be hired in Kathmandu) and personal trekking gear.